Before developing and embarking on your improvement plan you will want to review and assess your practice systems and processes to identify areas that may be contributing to your current performance results. By reviewing this information in a systematic way, you will be able to get a clearer picture of where changes can be made in your practice that will help improve your performance results. Links to several systems analysis and quality improvement tools are provided below. You are encouraged to review these tools and work through a systems analysis exercise with the staff in your practice, always keeping in mind the EPR-3 baseline area(s) you have identified for possible improvement. Once you have completed this activity you will be able to develop a problem statement and develop your improvement plan. Centers for Medicare and Medicaid Services Quality Payment Program (CMS QPP) - Provides an overview of the program, including information about MIPS and APMs. Agency for Healthcare Research and Quality (AHRQ) - Offers several resources including a resource guide and workbook for Asthma Care. American Academy of Pediatrics (AAP) – This site provides QI Networks, training resources, and their very own Bright Futures QI model. American College of Physicians (ACP) - Learn more about their quality initiatives and practice assessment tools. National Institute for Quality Improvement and Education (NIQIE) – Includes resources from CME programs, on-site workshops, and registry. Medical Group Management Association (MGMA) – Several Practice Management tools to use in your practice including a Physician Practice Patient Safety Assessment (PPPSA). The Institute for Healthcare Improvement (IHI) – Learn more about models for improvement, IHI Open School program, and their newest tools. Health Resources and Services Administration (HRSA) – Part of the HRSA Quality Toolkit includes an overview of QI Methodology, quality measures, and other fun resources to support your organization’s new or existing QI efforts. Healthcare Improvement Skills Center (HISC) – If you are new to QI, this is the place to enhance your skills with learning modules, and self-assessment tools. AHRQ Innovations Exchange - Hundreds of quality tools, videos, articles and surveys. You can browse by subject. This is a one-stop shop. Community Health Association of Mountain/Plains States (CHAMPS) - Online resources intended to assist Region VIII Community Health Centers (CHCs) in becoming more familiar with the functions of quality improvement. American College of CHEST Physicians Provides several clinical guidelines in chest medicine including but not limited to airways disorders, pulmonary vascular disease, chest infections and thoracic oncology, as well as a clinical trials registry to connect physicians to clinical trials in respiratory disease. HealthIT.gov: ambulatory and inpatient QI worksheets that will assist in documenting, analyzing and planning enhancements to information flows for specific quality improvement goals. The Institute for Healthcare Improvement (IHI): The Quality Improvement Savings Tracker Worksheet may be used throughout the organization to track cost savings associated with waste reduction efforts and to adjust for annual changes. Community Health Association of Mountain/Plains States (CHAMPS): Several printable worksheets including Asthma and Diabetes flows, audit tools and assessments. PDSA: Plan Do Study Act. 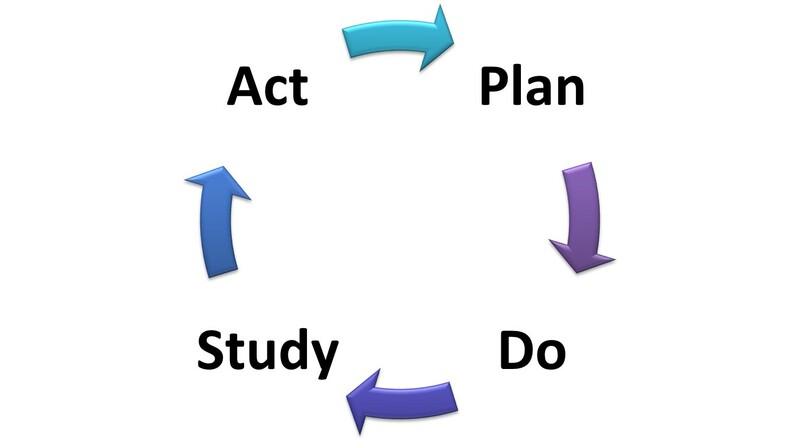 You can use plan, do, study, act (PDSA) cycles to test an idea by temporarily trialling a change and assessing its impact. This approach is unusual in a healthcare setting because traditionally, new ideas are often introduced without sufficient testing. Six Sigma: Six Sigma is a set of techniques and tools for process improvement that originates from the automobile industry with motorola in 1986. It asserts the need to reduce process variation, identification of characteristics that can be measured, analyzed, controlled and improved; and buy-in from all stake-holders, including those in management positions. Lean: Lean, also originally from the automobile industry, focuses on the customer (patients, regulatory bodies, payers, and providers) to determine what the customer would consider of value. Lean emphasizes empowering individual employees to improve quality, expecting every individual employee to exhibit vigilance in identifying and addressing poor quality and waste. Share your QI projects and experiences with other AAAAI members in the Quality Showcase. Complete the online form to submit a description of your project and it will be posted in the discussion board below. Review the board to read about others' projects and experiences, and post comments and questions for the project authors and other readers. To submit your QI project: complete the Quality Showcase Submission Form. The Joint Task Force on Quality and Performance Measurement is a task force of the AAAAI and the American College of Allergy, Asthma and Immunology. The task force has developed several sets of quality measures covering allergen immunotherapy, allergic rhinitis (currently under review), drug allergy and urticaria. Primary Immunodeficiency measures have also been developed by the Primary Immunodeficiency Committee of the AAAAI. Please contact the AAAAI at info@aaaai.org if you would like to review one or more of these quality measure sets. In addition, the AAAAI has made changes to its Quality Clinical Data Registry (AAAAI QCDR) for allergist and immunologist to participate in the new CMS quality payment program known as the Merit-based Incentive Payment System (MIPS) beginning in 2017 under the Medicare Access and CHIP Reauthorization Act of 2015 (MACRA). The AAAAI QCDR has been collecting data for reporting years 2014, 2015 and 2016 for the Physician Quality Reporting System (PQRS) program, which will now be reported under the new 2017 MIPS program - Quality Performance Category.